The drummer from one of my fave bands of the ’70s has passed away. Dale “Buffin” Griffin, a founding member of Mott the Hoople, died peacefully in his sleep last night. He had been diagnosed with Alzheimer’s disease in 2009. Griffin played on all the Mott the Hoople albums, including 1972’s breakthrough All the Young Dudes (which featured the hit title-track written for the band by David Bowie), 1973’s Mott(which boasted the single “All the Way from Memphis”), and 1974’s Hoople (the band’s last studio album). 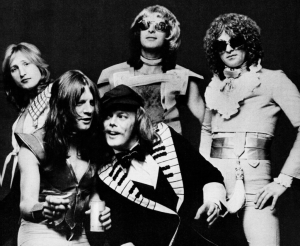 After his time with Mott the Hoople, Griffin went on to play in the offshoot group Mott, as well as British Lions. He also produced albums by Hanoi Rocks and the Cult.